Angry Birds is the most popular game of year 2010 for android phones,Windows 7. It is developed by Rovio corp. but it is developed for Nokia Symbian^3 not for Symbian s60v5 platform .It is not available for Symbian v5 platform yet but you can download it and run it on java platform. 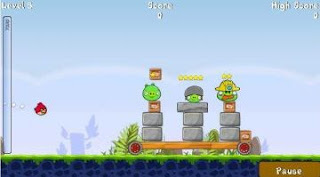 Now you can play it on your Nokia 5800 or other s60v5 phones like 5230, N97, 5530, 5233, X6 though it it not official, it is a java game version of Angry Birds.